Make your own live-cultured, probiotic-rich superfoods. 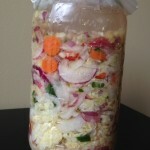 The method I teach is a traditional method of fermentation. It is the process of submerging veggies (and sometimes fruits) in a salt-water brine to bring out delicious, tangy flavors and a wide range of health benefits. In my classes, I teach small batch fermentation, which allow you to use mason jars as fermentation vessels. This makes it easy to try new recipes – no special equipment is needed and small amounts of produce are required. Sauerkraut, dill pickels, and kimchi are all fermented, but many of these products on the grocery store shelves have been heat treated for storage. The heat treating or pasteurization process removes many, if not all, of the amazing health benefits of the fermentation process. Fermented foods are loaded with good bacteria and probiotics that improve gut health, strengthen immune systems, assist with bowel regularity and weight loss, lower cholesterol, and increase nutrient absorption. What do we do in a Fermentation Class? Contact me at dreasbaking@gmail for more details.